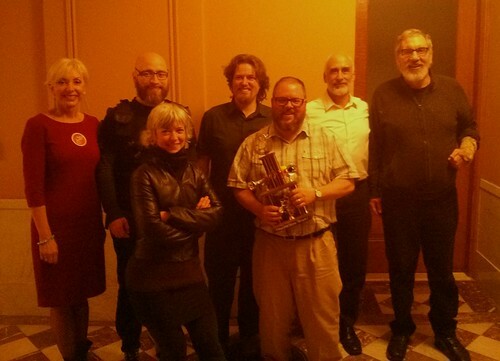 Home » Blog » Transportation Trivia takes over City Hall! 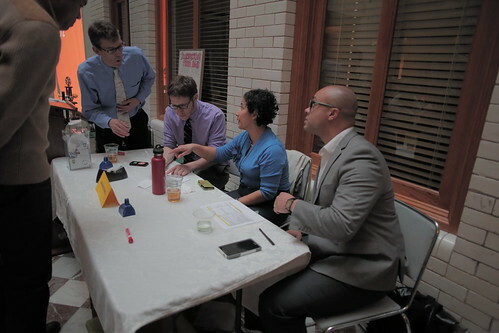 Transportation Trivia takes over City Hall! 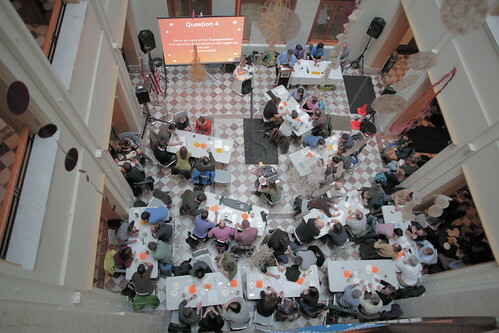 The fourth installment of Community Cycling Center’s Transportation Trivia invaded City Hall. This time, we moved our event to the political epicenter of our beautiful city and the folks at City Hall welcomed us with open arms. The who’s who of the transportation geeks and wonks were on hand to prove to the world (all right maybe just PDX) who knew more about our city’s mobility habits, policies, and history. So, who is the wonkiest of the wonkiest when it comes to knowing yielding rate at a Rectangular Rapid Flash Beacon or naming all the Transportation Management Associations in the region? Last August it was Maxx Tracks in Your Face. They made a commendable effort this time around and held their own at 4th place. However, Wednesday night’s victory went to the Rumble Strips, consisting of some familiar faces like Lake McTighe (Senior Transportation Planner at Metro and Community Cycling Center board member), Roger Gellar (City of Portland Bicycle Coordinator), and Greg Raisman (PBOT Traffic Safety Specialist). Second and third place were shared by Lancaster Engineering’s Vision Beer-o and MUTCDOMFGRCTID respectively. Team Separated Psycho-paths went away with the best team name. City of Portland Signals Division Manager, Peter Koonce, was once again our esteemed M.C. for the evening, leading us effortlessly through 4 rounds of brain-twisting trivia. Koonce, a consummate professional, engaged with audiences for the last four trivia evenings and hopefully many more in the future. A new addition to the evening was our judging panel, made up of Aaron Brown, Cycling Center board member Jackie Yerby, and CEO Mychal Tetteh. They played an integral part reviewing contested answers. A mammoth thank you to our event sponsors: Lancaster Engineering and Kittelson & Associates, Inc. for making the night possible. We also want to thank Portland City Hall for hosting us this year and putting up with the most dedicated transportation wonks in the nation. Spin Events, Hopworks Brewery, Longplay Winery, and Stalk Market were our food and drink sponsors for the evening, and Chrome, Filmed by Bike, Pedal Bike Tours, Western Bikeworks, ReRack, Portland Streetcar, Trailhead Coffee, and Mimosa Studios provided stellar door prizes. Transportation Trivia is not just an arena for wonks to get wonky, but it is also a fundraiser for the Community Cycling Center. Together we raised $3,867 in one evening. A special thanks goes to Greg Raisman, winner of ReRack’s Yakima bike rack. Without a car, he auctioned the rack off to the highest bidder. The altruistic jester raised an extra $120. Thanks, Greg! You think you got what it takes? The bar is high and you will need to be ready. Our next Transportation Trivia Night is in August! Rumble Strips, start practicing and studying now; you’ve got to defend your title.